Vault of Light: 20 Days of Gold Making - Day Eleven. 20 Days of Gold Making - Day Eleven. "Most of us use TSM, Auctioneer and.or Auctionator in combo with Postal - are there any other lesser known gold making addons you use?" I'll be honest - I'm not a great lover of addons. Some people have a list of addons as long as their arm. I've always been able to make do with just a couple and this has spread into my gold making as well. It took me an incredibly long time to begin using TSM. I installed it once and uninstalled it a few days later being completely overwhelmed. I eventually went back to it after a few months with a bit more determination to learn and use it. Recently my hard drive packed in and I've had to start over from scratch. Previous to this I did use TSM, Auctioneer and Auctionator and Postal. They all had their own uses but since losing everything I haven't picked Autioneer back up. TSM version two has just been released and the mailing part of the addon has been completely changed. This may mean I have no use for Postal anymore but it's going to take a little bit more investigation. Overall the new TSM seems a little scary but I'm getting used to it. I only downloaded it last night so it's going to take a bit of practice! 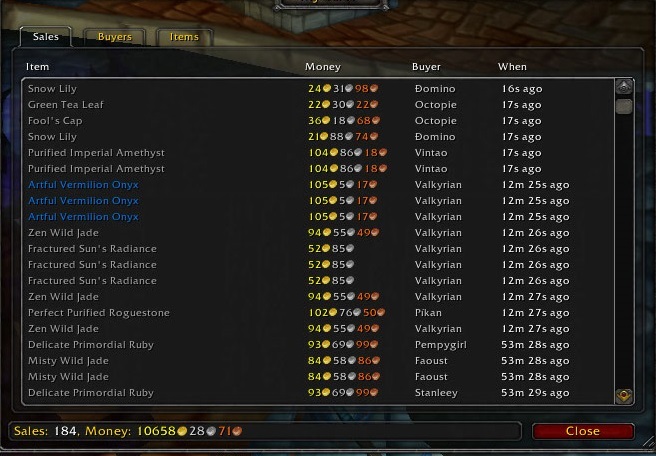 The only other addons I use for gold making are Mysales to keep track of recent sales and BankStack. I'm incredibly messy and unorganized so having bankstack to keep my bags and guild banks in check is a god send! With a few simple commands it rearrange your bags/bank into items which are similar, it'll put all of your cloth together all of your ore together etc.